Matt Dunham – WPA Pool/Getty ImagesTurkish President Tayyip Erdogan. The lira has stabilised on Tuesday morning after a dramatic decline over the last 9 days. Turkish President Erdogan has vowed action against “economic terrorists” and claimed the US is waging economic “war” against the country. The drop in the lira was sparked by US sanctions against Turkey, economic conditions in the country, and a strong dollar that is pulling foreign investment out of Turkey and back to the United States. The Turkish lira has stabilised on Tuesday morning after over a week of big losses. The lira rallied against the dollar on Tuesday morning from Monday’s lows. The US dollar is down 5% against the lira to $US6.53 at 9.35 a.m. BST (4.35 a.m. ET), retreating from a high of over $US7.24 (in other words, an all-time low for the lira). The lira is still down around 33% against the dollar so far in August. The drop is down to a perfect storm of fresh US sanctions against the country, economic conditions in Turkey, and a strong dollar that is pulling foreign investment out of Turkey and back to the United States. The consequences of the strong dollar have reverberated through emerging markets, with Argentina, India, and others also seeing steep drops in the value of their currencies. “The dollar is crushing everything in its path at the moment and this is not good for EM or global growth,” Neil Wilson, the chief market analyst for Markets.com, said in an email on Tuesday morning. 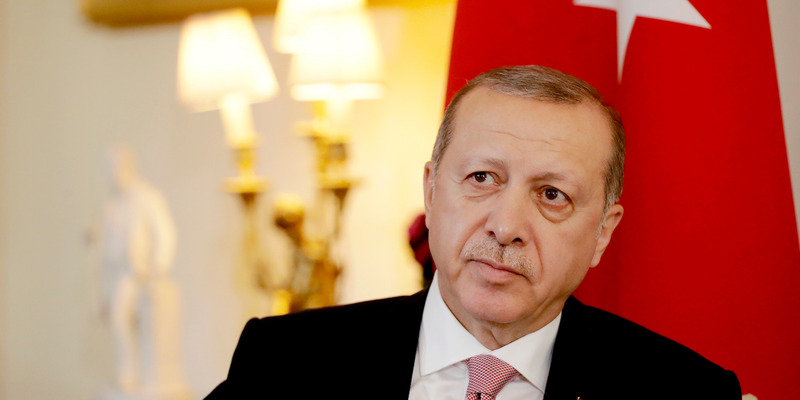 Turkish President Recep Tayyip Erdogan on Monday promised action against “economic terrorists” plotting to harm Turkey by spreading false rumours and vowing that they would feel the full force of the law, Reuters reported. “There are economic terrorists on social media,” Erdogan told ambassadors at the Presidential Palace in Ankara, adding that authorities are responding. “They are truly a network of treason… We will not give them the time of day… We will make those spreading speculations pay the necessary price,” he said. Erdogan said rumours had been spread that Turkey would establish capital controls following the decline of the lira, which fell 18% on Friday alone. He said the Ministry of the Interior had located 346 social media accounts that were spreading a negative perception of the economy and promised legal action would be taken. Bank analysts have warned that capital controls may be necessary to stabilise Turkey’s currency if Erdogan continues to refuse to raise interest rates. Investigations have also been launched from the prosecutor’s office in Ankara and Istanbul into individuals suspected of being involved in actions that threaten the economy. Evidence of the accusations has not yet been disclosed.